Taste test: I think these are the first sour cream & cheddar chips that I've tasted that haven't been rippled. 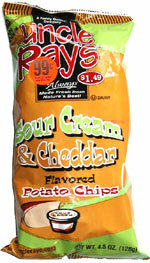 The regular chip doesn't hold in the flavor as much, it's not as much of a cheddar taste than with other rippled varieties. Still, it's a pretty good chip, thin cut if you like those style. Enough residue to leave stuff on your fingers. Smell test: A slight cheese aroma. From the package: Chapter 5 of the Life and Times of Uncle Ray. The bag was squished, so we couldn't get the top part of the chapter.